Boardwalk Empire is a Drama programme that first aired in 2010. America in 1920: The Great War was over, Wall Street was about to boom and everything was for sale, even the World Series. It was a time of change when women got the vote, broadcast radio began and young people ruled the world. From Terence Winter, Emmy Award-winning writer of "The Sopranos" and Academy Award-winning director Martin Scorsese, BOARDWALK EMPIRE is set in Atlantic City at the dawn of Prohibition, when the sale of alcohol became illegal throughout the United States. On the beach in southern New Jersey sat Atlantic City, a spectacular resort known as "The World's Playground," a place where the rules didn't apply. Massive hotels lined its famous Boardwalk, which featured nightclubs, amusement piers and entertainment that rivaled Broadway. For a few dollars, a working man could get away and live like a king – legally or illegally. The undisputed ruler of Atlantic City was the town's treasurer, Enoch "Nucky" Thompson (Steve Buscemi), a political fixer and backroom dealer who was equal parts politician and gangster and equally comfortable in either role. Because of its strategic location on the seaboard, the town was a hub of activity for rum-runners, minutes from Philadelphia, hours from New York City and less than a day's drive from Chicago. 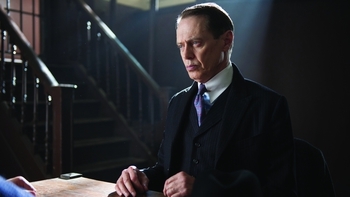 And Nucky Thompson took full advantage. 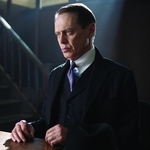 Along with his brother Elias (Shea Whigham), the town's sheriff, and a crew of ward bosses and local thugs, Nucky carved out a niche for himself as the man to see for any illegal alcohol. He was an equal-opportunity gangster, doing business with Arnold Rothstein (Michael Stuhlbarg), "Big Jim" Colosimo (Frank Crudele), "Lucky" Luciano (Vincent Piazza) and Al Capone (Stephen Graham).